The Biometrics Institute and the United Nations Counter-Terrorism Committee Executive Directorate (CTED) have signed an Arrangement on Cooperation in response to numerous Security Council resolutions on counter-terrorism (in particular resolutions 1373 (2001), 1624 (2005), 2178 (2014), 2322 (2016), 2309 (2016) and2396 (2018). Together they will define, develop and support the facilitation of projects to promote the implementation of these resolutions and, in particular, will address the need to strengthen Member States’ capacity to collect, store and share biometric data. International terrorism constitutes an increasing threat to world peace and security. Border and law enforcement agencies are facing a multitude of challenges related to the identification and cross-border mobility of terrorists, including foreign terrorist fighters and the travel of returnees, partly due to a lack of biometric information being gathered and shared across international borders on known and suspected terrorists. The Biometrics Institute and CTED have pledged to promote the responsible use of biometrics in the field of counter terrorism, identity and border control management, aviation and maritime security, with a view to contributing to the sustainable development of land, sea and air security and transportation, to the prevention and countering terrorist threats and suppressing acts of unlawful interference. 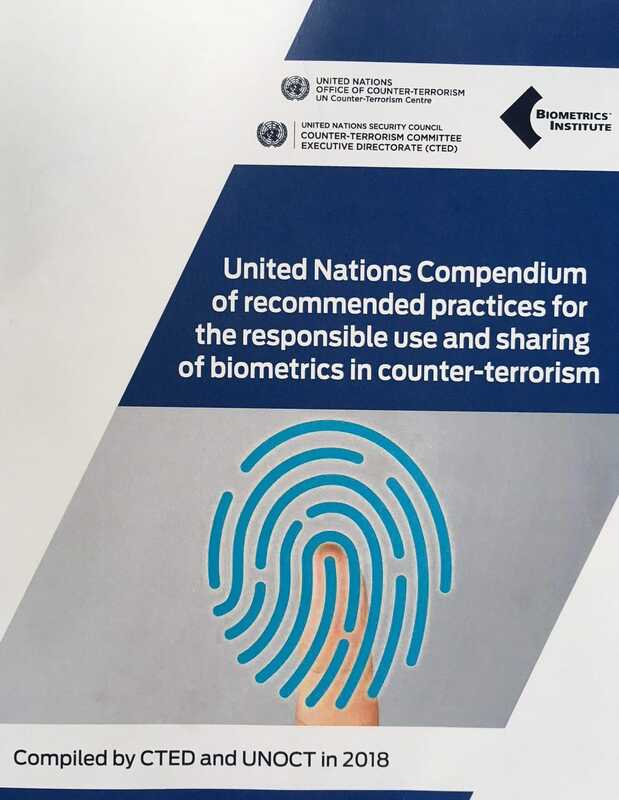 Phase One of this collaborative Arrangement has culminated in the production of the United Nations Compendium of Recommended Practices for the Responsible Use & Sharing of Biometrics in Counter Terrorism, which will be launched at the offices of the UN in New York on 29 June 2018. The Compendium is the first reference material of its kind to be produced and made available at UN or international level. The Biometrics Institute formed an international consortium of experts from UN entities, governmental origins and biometric experts with a background in counter-terrorism, law enforcement, border management, biometric technology, privacy and data protection to write, edit and review the content of the Compendium. The Compendium was developed within the framework of the United Nations Counter Terrorism Center (UNCCT) of the Office of Counter-terrorism (OCT). The group comprises important actors involved in biometrics such as ICAO, IOM, UNHCR, UNOIDC, OIPC-INTERPOL, IMO and others. Member States are being asked to share data collected at border security, customs and immigration via regional and global law enforcement channels with trusted partners such as INTERPOL. The Compendium provides technical implementation considerations and good practice guidance, including the need to protect privacy and personal data, and highlights the importance of understanding the potential for error in the collection of biometric data. Phase Two of the Arrangement will involve CTED, with the assistance of the Biometrics Institute, running regional workshops, starting with high priority countries that most need to start adopting biometric technologies. The Biometrics Institute and CTED will also look to identify synergies between ongoing and forthcoming initiatives launched by each organisation; develop dialogue with other international and regional organisations within the context of counter-terrorism and biometrics; support each other at open briefings, special events, working groups, workshops and training programmes; and support each other in their research, publications and endeavors to promote the responsible use of biometrics in countering terrorism. The Biometrics Institute is the independent and impartial international membership organisation for biometric users and other interested parties. It was established in 2001 to promote the responsible use of biometrics. It provides its members and key stakeholders with information about best practices including the Biometrics Institute Privacy Guidelines, the Top 10 Vulnerability Questions, an annual industry survey and soon to be released Understanding Biometrics – Considerations for Implementing a Biometric System. It has over 240 membership organisations from around the world representing government agencies, other users, suppliers, academic and privacy experts.